7 and 8 speed compatible. Shimano compatible. Great for changing the size of easily. Watched a couple of videos and for someone who has never changed a chain before, was able to with ease. The master chain link is brilliant. 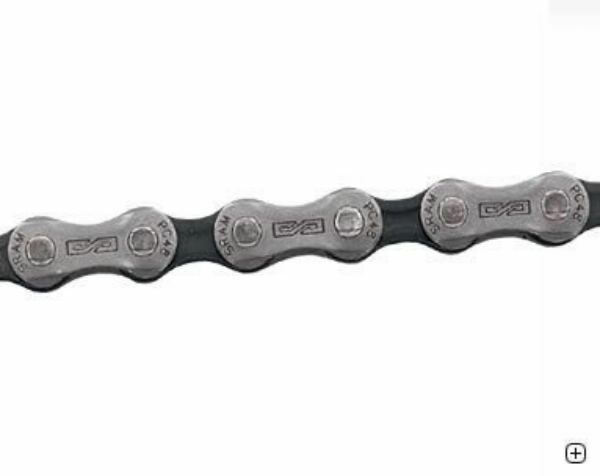 Great chain - SRAM's quick links work really well and they last well! I've got a liking for SRAM chains. I had a problem with another brand breaking - the bike shop I found open only had SRAM in stock and I've stuck with them ever since. Once again very good service and delivery from Merlin. Cost effective chain, superb quality, powerlink connector included. Simple low cost chain upgrade. As ever super speedy delivery at the right price !! Have used product before so aware of Quality and durability. I have used quite a few of these chains on my 7-speed bike and have had no problems at all. The joining link make it possible to remove the chain for cleaning. Good chain, the power link makes chain removal very easy. I find sram chains value for money and with the quick link system its easy to fit and fix on the trail with a spare link.